Doris Phua, chief executive of Da Vinci, answers questions during a press conference in Beijing in July, after CCTV accused it of selling fake furniture at high prices. Later, the company said it paid the CCTV reporter more than $150,000 through a public relations company to halt further stories. 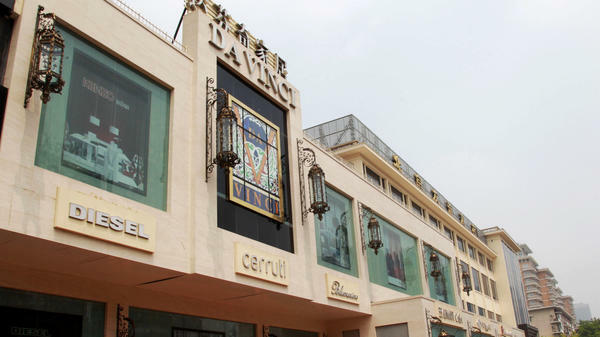 In July 2011, Chinese state-run TV accused the luxury furniture retailer Da Vinci of passing off made-in-China goods as expensive Italian designer items. Now, a new report in a respected Chinese business magazine, Caixin, says the TV report was full of errors, and Da Vinci says it was blackmailed by the TV journalist. The Da Vinci furniture company showroom in Shanghai looks like a salon in Versailles. The price tag on a gilt-covered, Italian-made grandfather clock: more than $40,000. So it was big news last summer when China Central Television — the government's flagship network known as CCTV — reported that some of Da Vinci's ornate furniture didn't come from Italy, but from a common factory in South China. CCTV even found a factory salesman who appeared to corroborate the claim. Doris Phua, Da Vinci's chief executive, denied the charges in a tear-filled press conference, but the damage was done and the company's sales tanked. Now, a respected Chinese magazine called Caixin says the CCTV report was filled with errors, and the furniture company says it was blackmailed by the CCTV reporter for more than $150,000. Caixin reported this week that the salesman had recanted, and the general manager of the Chinese company that had supposedly built furniture for Da Vinci denied it in a Web video. "When I saw your report on Da Vinci and my company, I felt utterly stunned and angry," said Chinese furniture factory manager Huang Wencong. "The content of your report wasn't verified at all and seriously misleading." Da Vinci also said it paid the CCTV reporter more than $150,000 through a public relations company to halt further stories. Da Vinci provided bank transfer documents and a secretly recorded conversation as evidence. Zhang Zhi'an, an associate journalism professor at Sun Yat-sen University in Guangzhou, China, says the episode highlights a common problem with Chinese journalism today. "When there's negative news, a company hires a public relations firm to buy advertisements or pay off journalists to suppress the news from coming out," Zhang says. Over the years, reporters at smaller news organizations have been arrested for trying to extort money from various businesses, including a gas station, a food-processing company, a coal mine and a TV shopping network. Zhang says the Da Vinci case stands out because it involves the Communist Party's biggest news institution. "CCTV is the national commercial network," says Zhang. "It's a strange monster that has lots of power behind it. So, to expose corruption at CCTV takes a lot of courage." The case also highlights a broader problem with China's one-party state: Its actions have few external checks. "I think CCTV has too much power," Zhang says simply. The CCTV journalist who reported the Da Vinci story, Li Wenxue, denies taking money. He says the claim is "slander." So far, CCTV has no comment. Does this mean Da Vinci is blameless? "Da Vinci's definitely done something," says Liam Bussell, who works in Shanghai as the Asia-Pacific strategic marketing manager for Mintel, a global consumer research firm. "Maybe not to the extent they've been accused of, but there's something suspicious." Bussell points out that customs officials have accused Da Vinci of using a Chinese free-trade zone to make local furniture appear imported. Shanghai's industry and commerce bureau fined Da Vinci more than $200,000 last week for what it called substandard furniture. Given the corruption in Chinese media and the volume of counterfeit products in the country, Bussell says it's often hard to find someone in these disputes who's totally clean. And I'm Robert Siegel. China's booming economy has long cast a shadow of corruption. The problem is endemic to every level of society. The fact is many aspects of daily life in China require a payoff and the ruling communist party's anti-corruption campaigns have had little effect. NPR's Frank Langfitt reports on new allegations that the problem has spread to journalism and China's powerful state-run TV. FRANK LANGFITT, BYLINE: The Da Vinci Furniture Company showroom in Shanghai looks like a salon in Versailles. A gild-covered Italian made grandfather clock costs more than $40,000, so it was big news when China Central Television, the government's flagship network known as CCTV, reported some of Da Vinci's ornate furniture didn't come from Italy, but from a common factory in south China. CCTV even found a factory salesman who appeared to corroborate the claim. UNIDENTIFIED MAN 1: (Through Translator) Painstaking efforts paid off. Reporters eventually found the mysterious supplier that makes furniture for Da Vinci. LANGFITT: Da Vinci denied the charges, but its sales tanked. Then, this week, Caixin, an aggressive Chinese business magazine, did something unusual. It published its own investigation of the CCTV story. Caixin pointed out that the salesman had recanted and the general manager of the Chinese company that had supposedly built furniture for Da Vinci denied it in a web video. UNIDENTIFIED MAN 2: (Through Translator) When I saw your report on Da Vinci and my company, I felt utterly stunned and angry. The content of your report wasn't verified at all and was seriously misleading. LANGFITT: More damaging, Da Vinci claimed it paid the CCTV reporter more than $150,000 through a public relations company to halt further stories. Da Vinci provided bank transfer documents and a secretly-recorded conversation. Zhang Zhi'an is an associate journalism professor at South China Sun Yat-sen University. He says the episode highlights a common problem with Chinese journalism today. ZHANG ZHI'AN: (Through Translator) When there's negative news, a company hires a public relations firm to buy advertisements or pay off journalists to suppress the news from coming out. LANGFITT: Over the years, reporters at smaller news organizations have been arrested for trying to extort money from various businesses, including a gas station, a food processing company, a coal mine and a TV shopping network. Zhi'an says the Da Vinci case stands out because it involves the communist party's biggest news institution. ZHI'AN: (Through Translator) CCTV is the national commercial network. It's a strange monster that has lots of power behind it, so to expose corruption at CCTV takes a lot of courage. LANGFITT: The case also highlights a broader problem with China's one party state. Its actions have few external checks. Zhi'an put it simply in English. ZHI'AN: I think that CCTV has too much power. Its power should be, you know, restricted and also should have been monitored by other media. LANGFITT: The CCTV journalist who reported the Da Vinci story denies taking money and calls the claim, quote, "slander." So far, CCTV has no comment. Does all this mean Da Vinci is blameless? LAIM BUSSELL: Da Vinci's definitely done something, maybe not to the extent that they're being accused of, but there's definitely something suspicious going on. LANGFITT: Liam Bussell works in Shanghai as a strategic marketing manager for Mentel, a global consumer research firm. He points out that customs officials have accused Da Vinci of using a Chinese free trade zone to make local furniture appear imported. Given the corruption in Chinese media and the volume of counterfeit products here, Bussell says it's often hard to find someone in these disputes who's totally clean. Frank Langfitt, NPR News, Shanghai. Transcript provided by NPR, Copyright NPR.